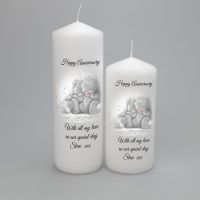 Candles are the perfect way to celebrate an anniversary, whether its to give to each other or friends and family wishing to give something special to the couple. 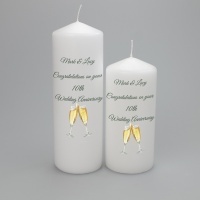 Our wedding anniversary candles can be personalised to your requirements and with option to gift wrap in cellophane with curly ribbon. If you require something not shown then contact us with your idea and we will work with you in producing the perfect candle for the anniversary. 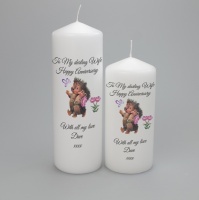 A Happy Anniversary personalised candle with hedgehogs.